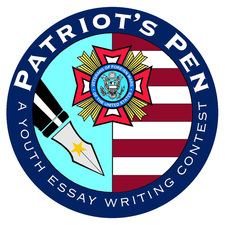 The Patriot's Pen program is open to students in grades 6-8, who are enrolled in a public, private or parochial high school or home study program in the United States and its territories. Next, it is time to start drafting considering the theme. Essays must be no less than 300 words and cannot exceed 400 words and should be submitted to the Post, along with the completed Patriot's Pen entry form no later than the November 1 deadline. Knowledge of the theme is worth 30 points: You must show a thorough knowledge of the theme in your work. Demonstrate you have researched the issue extensively. Theme development is worth 35 points: Answer all relevant facts about the theme such as the who, what, where, when and why. Relate the theme to your own experiences. Clarity of ideas is worth 35 points: Write your essay in an easy-to-understand format. Leave your reader with a clear understanding of your explanation of the theme.